Sidewalk sheds can be understood as a distributed superstructure within the city, one that demands the same level of design sensitivity as permanent features such as bridges or subway stations. Softwalks realized during our research that the function sidewalk sheds provide is more important than the form they take. Then, instead of trying to re-invent the wheel, we decided to focus on making incremental improvements to transform them. For Softwalks, we made our best effort to research each effort to improve sidewalk sheds by non-profits, private interests, and government initiatives in the US and abroad. Along the way we learned about the different types of sidewalk sheds, their logic and design considerations, and why some remain in place year after year. Through interviews and observational research we began to realize the negative effects sidewalk sheds have on businesses, communities and sidewalk culture. The reality and challenges of improving sidewalk sheds are significant, yet there are opportunities to innovate. 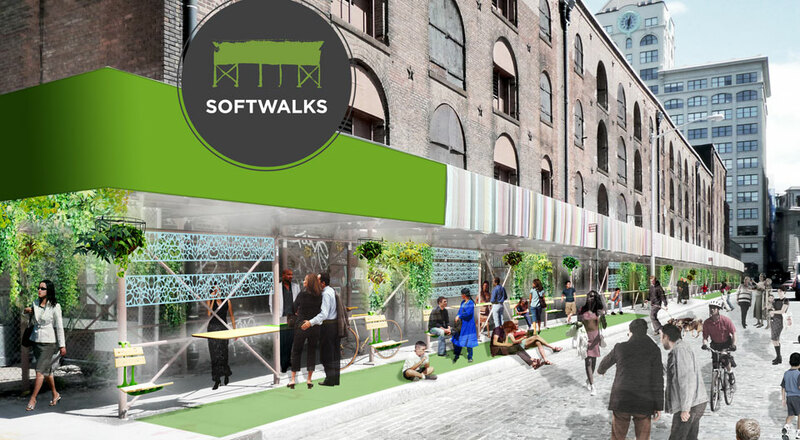 Softwalks is inspired by the successful pilot projects the DOT has implemented in the last five years to transform various streets into pedestrian plazas, such as the theater district on Broadway. These pilot projects, aided by light, quick and inexpensive amenities mitigate risk and lead to incremental improvements. This demonstrates how small experiments are a highly effective planning strategy for creating change within complex situations with many competing stakeholders. From the first spark, to quick prototypes using an iterative process, Softwalks is capable of producing every stage of a product's development. Our parts undergo a rigorous user testing phase to ensure we know all of the unintended uses and consequences of the work when it is placed in public space.